I was really tired last night--I chalked it up to a busy clinical day. I went to bed before 10 and woke up at about 8. The first thing I noticed was that I had a sore throat and a cough, followed by fever and malaise. I was down for the count. I knew I was going to get sick when I went back into the clinical setting. I washed my hands and everything, but it's everywhere, I guess. I'm thinking about the woman who coughed at me on the elevator. thanks! I rested the entire day, mostly in my recliner. Malida went out and got me wor won ton soup, which is what we like when were are sick. I drank hot water with honey and lemon, and then just warm water. I guess cold water is a no-go in Thai culture when you are sick. I watched tv for a while and slept a lot. If I had to get sick, today was the perfect day for it. I had no plans, and nothing to accomplish. I was going to take Malida out and practice photography, but that can wait for another day. My hope is that this won't last longer than 24-48 hours. I'm giving my immune system a pep talk, and expecting it to do great things. Don't let me down. 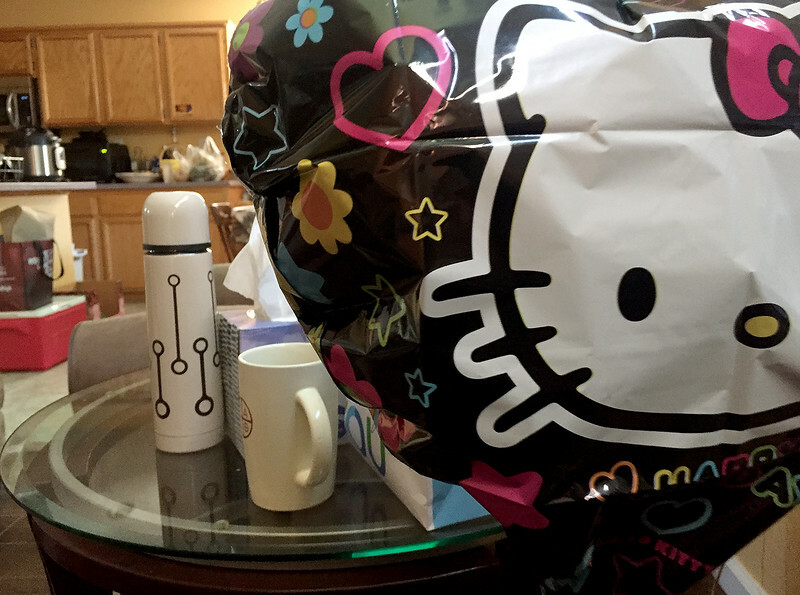 My Hello Kitty balloon from my birthday drifted down to eye level this morning to keep watch over me.